Woohoo! It’s finally warm outside and that means we can stop complaining about the cold and snow and start complaining about being hot. (A good problem, right?) With the changing temperatures, it’s important to be aware of how your home and family are impacted. So, we’ve put together a few tips on summer prep. Increase your water intake from 8-10 glasses to 12-15 glasses of water every day. Staying hydrated is important for protecting yourself from the sun and for normal functioning. Use this chart from Hawaiian Tropic to determine which SPF is right for you and consider a cooling sunblock with aloe. Depending on what your adventure of choice is, here are some more specific tips to ensure you don’t overheat. 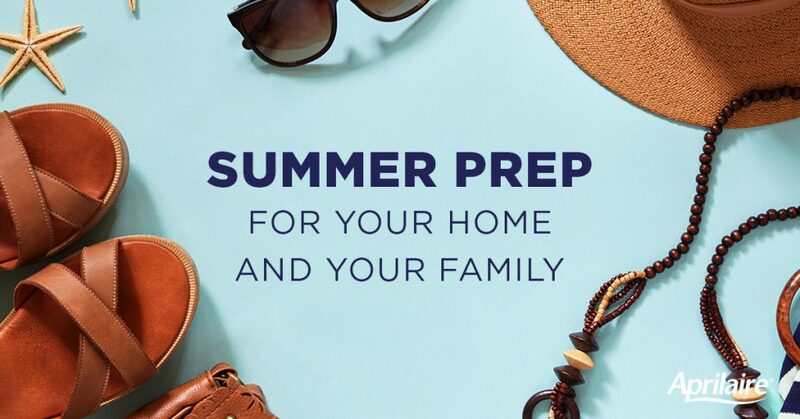 Now it’s time to get your home ready for the summer. Here are a couple tips for keeping your home cool. In order to make sure your unit is in working order, you need to test it before the temperatures become intolerable. The air filter might need to be replaced and you will need to clear any debris from around the vents and exhausts and make sure to remove any dirt from the unit itself. If all else fails, call a professional. Did you know that ceiling fans are made to rotate with the seasons? Clockwise in the winter to help circulate heat that’s risen, and counterclockwise in the summer to increase a cool breeze downward. So rotate those blades to get maximum cooling! If your basement is completely or partially underground, it will naturally stay cooler during the summer. And if you have a finished basement, you and the family can spend more time down there during the warm months. Just make sure the electricity and plumbing are functioning and there’s no residual mold or mildew.